The American Hosta Society asks its members to vote on their favorite hostas. Here are the top 10 of their most recent popularity poll. 1. June. It’s hard to pick only one, but this is at the top of my list too. Hosta ‘June’ takes top rank. 2. Sagae. It’s big and beautiful with12″ leaves. 3. Liberty. This comes from the lineage of Sagae, but wow, look at the colors. Liberty can make a statement in the garden. 4. Guacamole. This one boasts sweetly scented flowers in August. 5. Blue Angel. It’s huge and it’s blue…need I say more? 6. Striptease. Noted for its catching white strip in the center of each leaf. 7. Paul’s Glory. Highly textured leaves provide sun and slug resistance. 8. Stained Glass. This is currently my 2nd favorite hosta. Try planting it next to ligularia for a beautiful color combination. 9. Gold Standard. This hosta can supposedly handle slightly wet conditions. 10. Halcyon. A blue-leaved hosta that true to its name provides a sense of tranquility and peace. The first thing that draws me to a raised bed garden is how neat and tidy they appear. I love that they are clean and organized, and I especially like the perfect pathways between them. My first vegetable garden was an 8×8 designated patch which fit in the back corner or my city lot. It never felt like I was over-planting as I put in squash, beans, carrots, cukes, two rows of tomatoes , and a watermelon. At the start it looked picture perfect but didn’t take long to turn into total chaos. My plants grew and even produced a small crop, but it was hard to get in and tend them, plus with each passing day it became more of an eyesore. So that explains my crush for neatly arranged and maintained raised beds. But they’re also great for a number of other reasons. Perfect Soil! 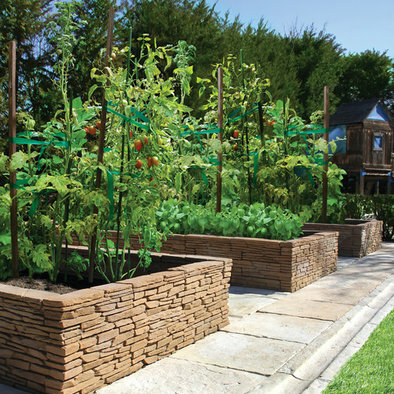 Raised beds give you the opportunity to bring in new soil, which means it’s easy to create your personal favorite combination of topsoil, organic material, peat, manure, etc. Also, bringing in fresh soil means you’re starting weed-free and with no compaction. It’s easy for roots to grow, so plants can become big and healthy. 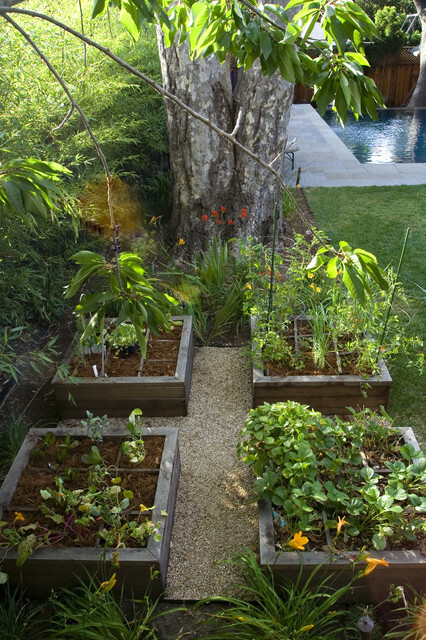 Raised beds allow for good drainage, even if your underlying soil is a little more soggy. It doesn’t take as long for the soil temperature to heat up in the spring, so you may be able to extend your growing season. We like that here in Minnesota! They’re more comfortable to work in because you’re not stooping all the way to the ground and they provide free and clear access all the way around. Depending on your personality, you may be well suited to build your own raised bed, but Tom also found a number of kits available if you need more guidance. A couple things to remember…they can be as long as you have space for, but the width should be narrow enough to reach the middle, so 5-6 wide if you can walk around it and 3 feet wide if you have access from just one side. A 12″ depth gives your plants decent space to spread their roots, but you can always go deeper. Raised beds at waist level are a great, accessible way to get your hands dirty. And although I think along the lines of tomatoes and squares, other can be more creative! Heucherella, or Foamy Bells, gets its name from its parentage – the plant is a cross between Heuchera (Coral Bells) and Tiarella (Foam Flower). Although the first cross was made in 1912, it wasn’t available to gardeners until the 1950’s, and there were no choices until the 1980’s. But it has become increasingly popular and there are more and more crosses being introduced. The plant shows characteristics of both coral bells and foam flower. Its foliage comes in a wide range of colors but has a distinctive, deeply lobed shape. For me, that’s reason enough to grow it…I love looking at those leaves! The flowers are usually lighter shades of pink or white, hang in wispy shapes above the clump, and usually bloom in spring. Foamy Bells should do the best in shade but I’ve read some can handle full sun, they’ll just grow slower. They can handle a little more water than heuchera, but still need well-drained soil, with a lot of good stuff (broken down organic material). Heucherella are fun plants to include in a garden design, because their leaves provide color all season long, especially in the shade. They work well other shade perennials: astilbe, jacob’s ladder, ajuga, ferns, lamium, bleeding hearts, and of course, hostas. They are also handy in front of larger shrubs to either hide the base or provide contrast – try them with dogwoods or hydrangeas. Use similar colors to keep your garden tranquil, or pair hot, contrasting colors to give it some pop. One habit to be aware of is that heucherella should be divided as they age. The crowns may not get as woody as heuchera, but if you divide your plants every 3-4 years they will stay healthier and you’ll also end up with more, so it’s not all bad.